Audi UK will today take the wraps off one of the fastest TT models ever to enter series production in a special preview held at the Vorsprung durch Technik brand’s digital hub, Audi City London. The ultra-modern Mayfair showroom will play host to the live unveiling of the all-new TT RS Roadster, and members of the UK media will be among the very first to witness the performance spearhead ‘in the metal’ on the same day that the TT RS Coupé makes its global debut over 5,000 miles away on the Audi stand at the Beijing Motor Show. The TT RS Roadster is the first all-new model to have its premiere here in the UK, acknowledging the fact that this market is the largest worldwide in terms of overall TT sales, accounting for almost 50 per cent of all European orders. Both new additions to the RS fold are powered by the multi-award winning Audi five-cylinder 2.5 TFSI engine, appearing here with the benefit of significant increases in power and torque to 400PS and 480Nm, which translate into supercar-rivalling performance – the 62mph sprint from rest can now be dispatched in as little as 3.7 seconds and top speed peaks at up to 174mph. UK versions of the TT RS Coupé and TT RS Roadster will become available to order in Audi Centres during the summer in advance of first deliveries at the end of this year. Another slightly less immediately evident debut is also being made as part of the concurrent launch events - OLED rear lights will be offered for the first time in Audi series production for the new TT RS. Like the Audi virtual cockpit and the comprehensive infotainment range, they are at the forefront of the Vorsprung durch Technik developments. A jury of international motor journalists has voted the 2.5 TFSI “Engine of the Year” six times in a row. Now Audi has further developed the five-cylinder engine in all areas – with lightweight construction measures, reduced internal friction and increased power delivery. As a result, the turbocharged engine gains a good 17 percent increase in performance at an unchanged capacity of 2,480 cc. At 400PS it is more powerful than ever before. The maximum torque of 480 Nm (354.0 lb-ft) is available between 1,700 and 5,850 rpm. It ensures fantastic pulling power, which accompanies the unmistakable sound. Cylinders positioned directly beside each other and far away from each other fire in alternation. This brings with it a very special rhythm. The TT RS Coupé accelerates from 0 to 62 mph in 3.7 seconds, the Roadster in 3.9 seconds – this corresponds to the level of a supercar. Audi regulates the top speed at 155mph, or 174mph upon request. 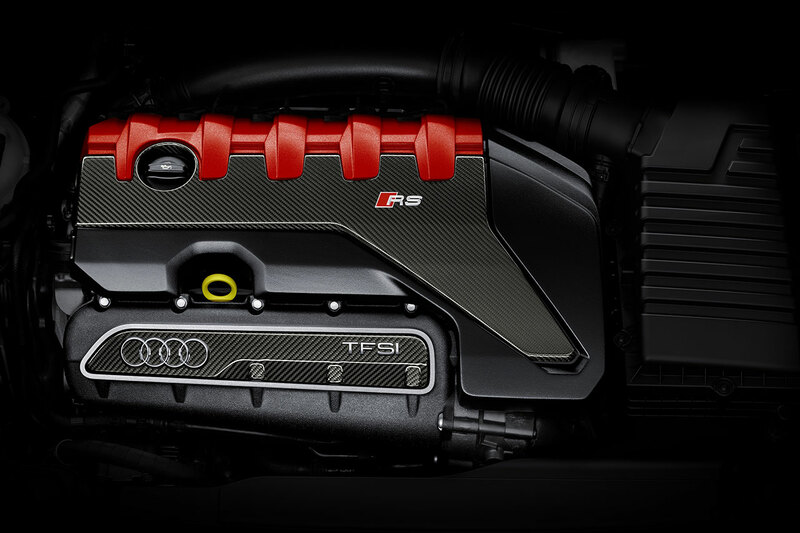 The might of the 2.5 TFSI engine is channeled via a seven-speed S tronic transmission. The dual-clutch transmission impresses with high efficiency and a large spread – its lower gears are short and the seventh gear has a long transmission ratio to reduce consumption. A plate heat exchanger controls the temperature of the transmission oil; a new angle drive to the propeller shaft reduces the weight by about two kilograms. The driver controls the S tronic transmission with the selector lever and the standard shift paddles on the sport leather steering wheel. A launch control system can also be called upon to initiate maximum acceleration with minimum tyre slip. The multi-plate clutch in the quattro all-wheel drive system distributes the power freely between the axles for incisive, high-grip handling. The wheel-selective torque control also works in favour of agility. Using the Audi drive select system, the driver can influence the quattro drive and other components such as the steering, S tronic shift points, engine characteristics and exhaust flaps. 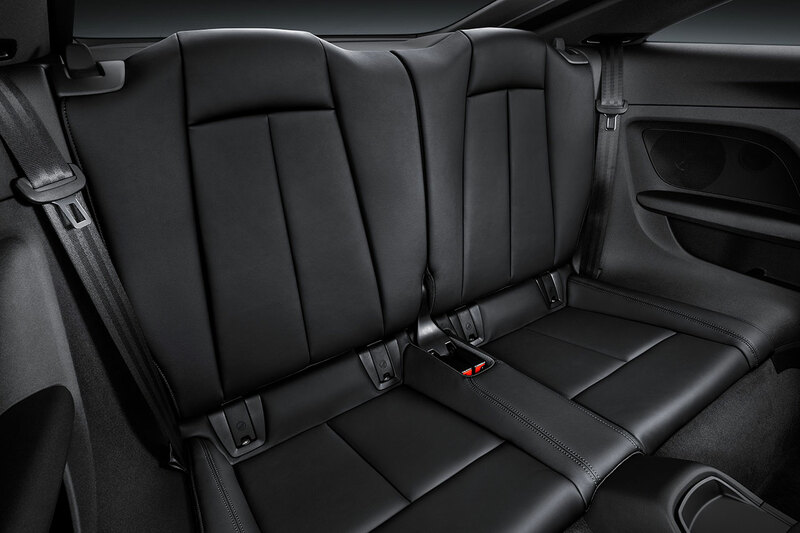 The four modes available for this are comfort, auto, dynamic, and individual. In addition to its light weight, the Audi TT RS has its taut chassis to thank for its outstanding handling. The new TT RS turns into corners with great balance and poise, and tackles them – guided by communicative steering – in a manner that is both controlled and relaxed. The progressive steering, whose ratio becomes ever more direct with increasing steering input, is RS-tuned. Targeted spring and damper modifications make the chassis with technically elaborate four-link rear suspension even more dynamic and precise. The body sits ten millimetres lower than the base model, and this also applies for the optional RS sport suspension plus with Audi magnetic ride where the damping characteristic can be changed electronically using Audi drive select. The TT RS Coupé and the TT RS Roadster are fitted as standard with 19-inch cast wheels in a five-arm polygon design with size 245/35 tyres. As an option, Audi supplies 20-inch forged lightweight wheels in a 7-spoke rotor design and tyres of size 255/30. Both wheel types are available in silver, matt titanium look or gloss anthracite black. The recessed hubs of the 20-inch wheels are inspired by motorsport. The braking system in the new TT RS packs a real punch. The internally ventilated, perforated steel discs on the front axle are 370 millimetres in diameter. Stainless steel pins join the friction ring to the aluminium brake disc chambers to dissipate the heat quickly. The eight-piston brake calipers with the RS logos are painted black (or optionally red). Alternatively, the front brake discs are available in carbon-fibre ceramic. They are particularly abrasion-resistant and light. In this case, the brake calipers are painted grey. At the rear, monoblock discs with 310 mm diagonals are used. For the first time in a series-production Audi, Matrix OLED (organic light emitting diode) rear lights will be offered for the new TT RS. These emit an extremely homogeneous, high-contrast light. The light can be continuously dimmed, it does not cast any shadows and does not require any reflectors – this makes the OLEDs in 3D design efficient, light and visually impressive. Each rear light contains four wafer-thin units which become smaller from the inside out. The biggest bears the TT logo and the four Audi rings. The TT RS has LED rear lights and LED headlights as standard. Alternatively, the latter are available as intelligently controlled Matrix LED units. The new TT RS Coupé and the new TT RS Roadster exude concentrated power, and standout features include the large air inlets, a Singleframe grille with a newly designed honeycomb grille and quattro logo. Along the flanks, aerodynamically-shaped side sills emphasise the dynamic design. At the rear of the new TT RS models, the fixed wing sitting on two thin double struts is a real eye-catcher. Alternatively, Audi can deliver the Coupé and the Roadster with an automatically extending spoiler. Under the striking bumper there is a strongly profiled diffuser insert with four vertical fins, leading to the two elliptical tailpipes of the RS exhaust system at its sides. The result: a lower cd value of 0.32 for the Coupé and 0.33 for the Roadster. Both models measure 4.19 metres in length, 1.83 metres in width and 1.34 metres in height. Audi delivers both models in nine colours, including the RS-specific tones of Nardo grey and Catalunya red, metallic. In addition to this, numerous customised paint finishes are available through the Audi exclusive package. The optional matt aluminium and gloss black styling packages set accents on the Singleframe, on the blade, on the RS rear wing, and on the diffuser insert. Controls and display in the new TT RS are focused completely on the driver. All information is displayed as standard on the fully digital Audi virtual cockpit with 12.3-inch screen. The driver can choose from three views, including a special RS screen that highlights the rev counter and provides information on tyre pressure, torque, and g‑force, among other things. The Audi virtual cockpit also displays a shift light which informs the driver that the engine speed limit has been reached. Audi also offers a huge amount of high-end infotainment technology. The options include MMI navigation plus with MMI touch including free text search and natural voice control, as well as the Audi connect online module with Wi-Fi hotspot. Using Audi phone box, compatible mobile phones can be charged inductively and paired with the onboard antennae for optimal reception. The new Audi smartphone interface technology displays selected apps from the handset directly in the Audi virtual cockpit. The Bang & Olufsen sound system is a highlight for fans of excellent acoustics.